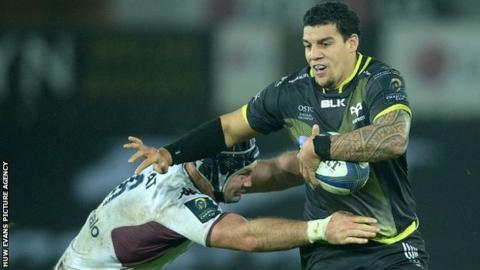 Ospreys hope to have centre Josh Matavesi available for their Boxing Day derby match with Scarlets. The Fiji international missed Ospreys' 33-27 Champions Cup loss in Bordeaux. Prop Nicky Smith is also available after injury for a match coach Steve Tandy expects to be one to savour. "The weather dictates a fair bit, you can't be throwing the ball around if it's greasy, but if there's any casual supporters at that game, it won't lack in intensity and physicality," he said. Ospreys have been involved a series of entertaining matches in Europe, the latest being their narrow defeat by Bordeaux-Begles, a match that produced eight tries. That was in stark contrast with the Scarlets' try-less 9-6 loss at home to Glasgow on Saturday. "Our game in Bordeaux was really pleasing to the eye and a huge physical effort," added Tandy. "But I'm sure there'll be some physicality and intensity in the game (on Boxing Day) and I'm sure it'll be a spectacle either way." His side start 14 points behind their west Wales rivals in the Pro12 table, with just four wins compared to the Scarlets' eight after a slow start to the season. "It would go a long way to closing that gap on them, but we've got three games now in the Pro12 where we need to put in positive performances," said Tandy. "The Scarlets have had a real good start to their season but we've got a bit of momentum in the way we're doing things at the minute." New Zealand scrum-half Brendon Leonard remains doubtful with a shoulder injury.